an ascetic with raised arms, protected by the celestial beings. 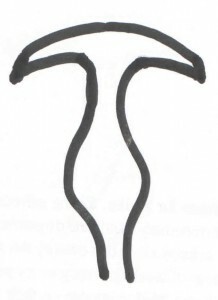 Another, similar, seal is partly damaged by a streak often mistaken by scholars. In both seals The ascetic under penance is guarded by two celestial beings holding a sugarcane stalk or a banana tree in their hands. The infernal beings are not shown on this seal.